Vowel sounds are one of the main sources of trouble for Spanish speakers of English. That’s because we tend to identify the vowel letter we are going to pronounce with the corresponding sound we produce in Spanish, but unfortunately they are not the same. This chart shows the twelve English vowel sounds (just monophthongs, we’ll deal with diphthongs later). Each sound can be heard by clicking on it, and there are also several examples of words where those phonemes are included. As you can see, in some cases the relationship between sound and spelling is very clear, whereas in others it becomes much more complicated. The sound /æ/, for instance, almost always corresponds to the letter a, but the sound /e/ can be the result of very different spellings (e, u, ea, a, ie, ai, etc.). In these cases it’s important to keep in mind that the sound is always the same, no matter how strange the combination of letters that produces it might be. So once we know how to do it correctly, it’s only a matter of sticking to it and using it with the appropriate words (this might seem very difficult now, but it is not, as we’ll see in the future). Vowel quality. This is the main element in a vowel sound, that is, what makes it different from another. It is defined vertically by the degree of opening of the mouth and horizontally by the position of the tongue at the front or back of the oral cavity (so, plainly speaking, this is about how much you open your mouth and how far back or forward you put your tongue). The vowel sound /æ/, for instance, is open and front because it is produced with the mouth wide open and the tip of the tongue at the front, touching the lower teeth. The /uː/ sound, on the contrary, is close and back. It is produced with the mouth pretty closed and the tongue raised backwards. This can be seen in the vowel quadrilateral on the left, which is a schematic representation of the mouth. The different points mark the place where the tongue goes to produce the sound. Length. Spanish vowels always last the same, but English don’t. There are long vowels and short vowels. When a vowel is long, the phonemic symbol is followed by a colon (/ɑː/, /ɜː/, /ɔː/, etc.). The rest are short. However, this feature is strongly affected by the voicing of the consonant which comes after the vowel (if there is one). Explained in a nutshell, this means that whenever a vowel sound is followed by a voiceless consonant its length is reduced, sometimes as much as fifty percent. So, the /i:/ in cheat is much shorter than the /i:/ in cheese. This phenomenon is known as pre-fortis clipping (go to that page for a very thorough explanation). Lip position. The position of the lips is much more important in English than in Spanish. There are three possibilities: rounded (as though we are going to give a kiss), neutral (just relax, nothing happens) and spread (like in a smile). The rounding is very noticeable in close, back vowels like /uː/ and /ɔː/. 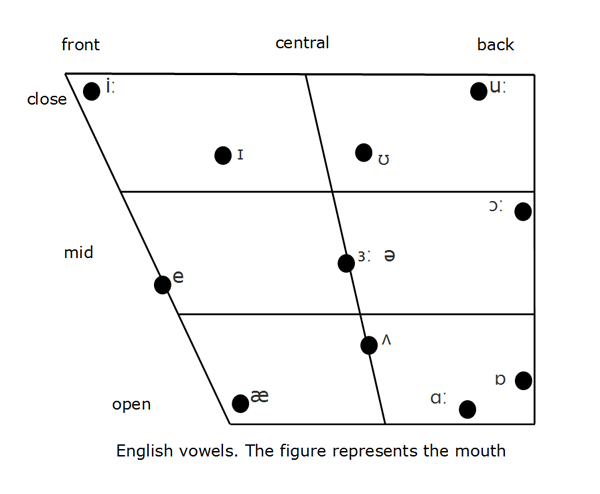 Front vowels tend to be produced with the lips spread (e.g., /iː/ and /æ/).